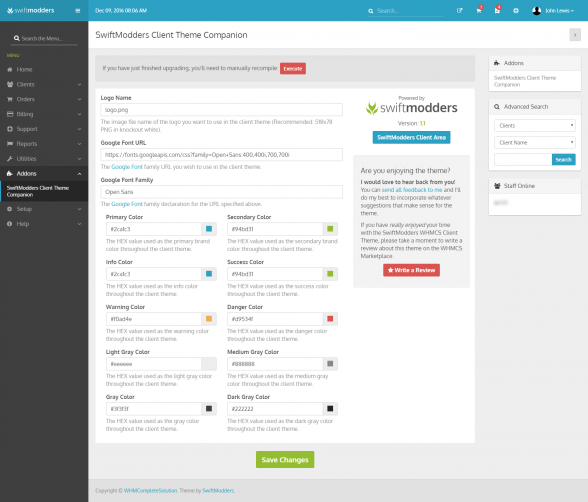 The SwiftModders WHMCS Client Theme has been inspired by many of the latest web design trends and features many areas of customizations from WHMCS’ default “Six” template. The theme offers a companion WHMCS addon that allows you to customize the colors and fonts in order for you to create your own unique experience. This theme is perfect for companies that want to promote a professional aura and impress potential new clients. Single Site License: Perfect for companies or individuals who only have one WHMCS installation. Unlimited Site License: Perfect for companies with multiple WHMCS installations and are looking to save costs. WHMCS 7.7 Support: This theme currently supports the latest version of WHMCS. One (1) Year of Support & Updates: This theme comes with 1 full year of support and updates that are renewable at $10 each year. Unencoded TPL Files: This theme allows for developers to customize the theme further by not encoding crucial TPL files. Boxed or Full-Width Layout: Select between a boxed style design or a full-width layout. 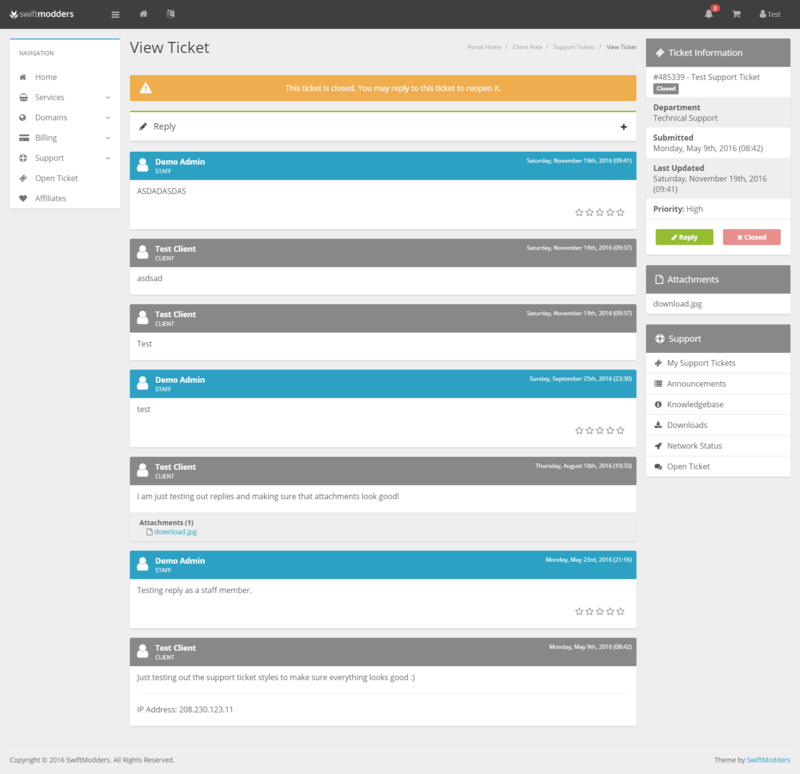 Custom Ticket View: This theme has a custom ticket view layout that resembles a conversation for that personal touch. SwiftModders Cart: This is a custom version of the default WHMCS Standard Cart. SwiftModders Comparison: This is a custom version of the WHMCS Premium Comparison Cart. SwiftModders Slider: This is a custom version of the WHMCS Universal Slider Cart. Customized Login Page: This theme comes with a customized login style with an editable background image. Official WHMCS Addon Support: This theme has official support for the Project Management, License Management, and Chat WHMCS addons. Easy Color Theme Adjustment: Set your companies branding colors in the addon to help make it your own. Google Font Support: Change the Google Font selection to the one that best matches your brand. Logo Branding: Swap out the SwiftModders logo with your companies brand. Layout Style: Choose between the full-width or box-style layout for your theme. Dark or Light Header/Navigation: Choose between a dark or light-styled header and/or navigation. Top or Left-Side Navigation: Choose between the top or left-side placement of your navigation. Ticket View Style: You have the choice of going back to the classic-styled ticket view if the new conversation-style does not work for you. Remove SwiftModders Copyright: Enjoy a white-label experience and remove any SwiftModders credits. Custom CSS: Add your own custom CSS or SCSS code to customize your design further. hello , RTL not supported ? Hello, as of right now there is no RTL support for the theme. I am hoping to add this in the future. For any other pre-sales questions please visit my website and contact sales :). John, thank very much for this beautifull theme, easy to install and modify. I see themes from other companies costing more than double the price of your theme, and are not as good as your work. Hope you continue developing this theme, for many years! Thank you so much for your feedback, Alvaro! Your business and support mean a lot. Thank you so much for your feedback, Julian. Really appreciate your comments! Really appreciate you sharing your thoughts on my theme Nick! The best WHMCS client area theme i have ever worked with! Its very true to the WHMCS Six theme, and lets you customize it just as flexible as other themes provided by WHMCS, with the addition of the swiftmodders Companion which is great. The theme is worth every dollar, and should even cost more. Thank you so much for your feedback Haiko, I really appreciate it! I'm finding customising and manipulating the WHMCS interface like having dentistry without anaesthetic. This theme made my day. Works straight off and has enough theme controls to keep you happy. Also, because it's Bootstrap I can create nice content in other Bootstrap website, cut and paste the code and know it will work. Great stuff. Tony! Really appreciate the feedback and I'm glad you're enjoying it. Well what can i say that has not already been said by other customers... The theme is one of the most well designed WHMCS themes you will buy. It's super easy to customize with an additional place for custom CSS for the advanced user and it's flawless it really is and on top of that John is amazing with support! I have changed my hosting about 3 million times testing out different stacks and he has been there every time to reset my key and to make sure everything is working how it should. Trust me when i say this but you have to buy this theme if your looking for one because it will save time and money getting your website integrated and whmcs updates come free and prompt plus you get a professional design for your clients... what more would you want? Well, what can I say Daniel? Maybe, thank you for your excellent feedback! It's greatly appreciated! Speechless! I bought Client + Admin combo and recommend it. Easy installation and configuration, theme with efficient customization and I had no problems of incompatibility with any additional modules. Theme update is released very quickly after upgrading WHMCS, congratulations. I almost did not need the support, the theme works very well, but when I needed to answer questions answered quickly. I was a bit hesitant when I bought the client template but 10 months later I am glad to report that it was an excellent choice with top notch support. Very pleasant to clients. I look forward to purchasing admin area theme. Good work John! Great Client Area theme, thank you. Theme easy to install and easy to customize. The support is very fast. It took me less than 15 minutes to install and adjust the template, congratulations, great product and very easy to run and get a really brilliant result. We've been wanting to get away from our in-house developed control panel for years now. We've been slowly but surely getting WHMCS ready to be our main customer portal, I was looking to see if there were options beyond the basic WHMCS client (and admin) template and I'm so glad I came across this one. Great template with a clean modern look, good work! Jason, thank you so much for your review. I really appreciate your feedback! The Client Area theme is amazing! Very clean and modern. thanks John. Thank you so much for your kind words Mumtaz! Very modern theme; looks much better than the original theme. Also - great support from the creator. Really appreciate your feedback, Jano! I tested 4 templates and honnestly, this is the best, and also, never seen a fast and such great support. Thank you John Lewis for woderfull template. Great product. Well designed and constructed. Saved me days of work styling it myself and was well worth the cost. Thank you for the honest review, Justin. I greatly appreciate your kind words. Thanks for the kind words Giorgio! Excellent theme and great support / information! Definitely recommend this one! Thanks so much for your feedback Patrick and Happy Holidays! What a great theme! Exactly what I was looking for. Even clients are giving me (So also John) compliments about the design! Great job! Thank you so much for the kind words Maikel! The Theme made by Swift Modders is great! Very clean and modern. I especially like the administration of this theme, making changes are straightforward and easy. About the only minor suggestion I would make is, it might be worth making a really short YouTube video showing the install and how to make changes once the theme is installed. I was a little lost to start with but once I figured it out I was off and going. Anyway Great theme, I highly recommend it. I think SwiftModders is the best Client Area Theme for WHMCS. 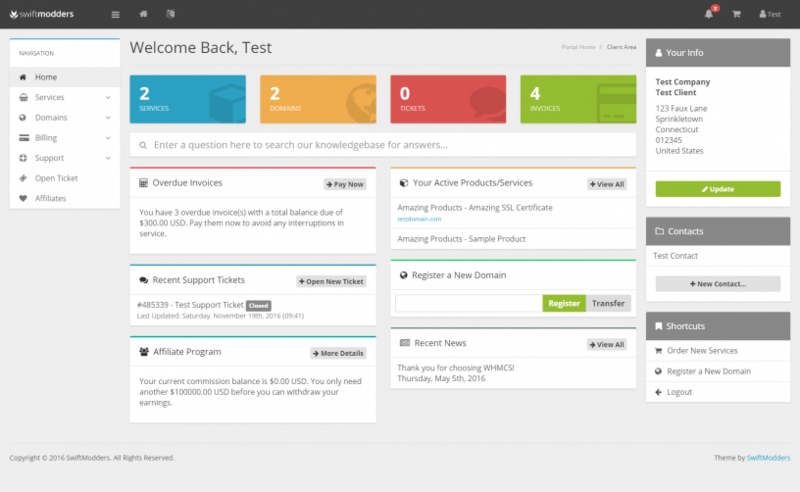 Beautiful and responsive design, quality work on the theme elements and fast support from John. I immediately bought the Admin Theme and recommended it to everyone. Thanks for a good job! Thank you for the review Anton, I greatly appreciate your feedback! Affordable and very customizable. Very happy to have this. Thanks! Thank you Wade! Always appreciate your support and feedback. Muy buena calidad y con actualizaciones recientes. Buen trabajo! If your looking for a modern clean look for your WHMCS install, then this theme is for you. Easy to install, easy to customise and your clients will just love you for using it. I would 100% recommend this theme. I have since purchased the admin area theme too, again I would also highly recommend getting that too!! Thanks for the kind words and feedback James. Really appreciate your support! I just purchased this theme and I must say, it's very easy to use. I'm very happy with my purchase. Thanks for the review James, I really appreciate the kind words! Amazing client area theme, easy to set up and looks nice as well! Thank you for the feedback Conner, I'm really happy you're enjoying it! After a week of running the client theme in Production I am extremely pleased! The theme has been amazing to work with and I haven't had any troubles with it to date. The ad-don provides and adequate amount of customization without any compromise. The theme is fast, responsive and looks to be really well built. Thanks for your review Liam, I really appreciate all of your feedback! Congratulations on developing the template. I bought and installed it easily and everything is working perfectly. The left navigation menu needs to follow the WHMCS settings if I put a product group as HIDDEN yet it appears in that menu. Thank you for your feedback, Leandro! The navigation actually functions similar to what WHMCS provides, so I am not sure I would be able to accommodate this change. I would recommend bringing these feature to WHMCS. I just love the theme. It's beautiful. However, It would be a great idea if the user can minimize the right sidebar just like the left one (menu). It will give users a Full-width browsing experience just like the default six theme. I have already purchased some order form templates but couldn't use them as the theme don't support any third party or even WHMCS default order form templates. The theme forces me to use the order cart template which comes along with the theme. I wish john ship another few stunning Order templates. Maybe a four column price box like pure comparison or a verticle price box like web20cart. Or maybe it will be a great idea if the template itself support any WHMCS cart template until he develops some other cart template. This is only the part I didn't like. Otherwise, the theme is awesome. Thank you for your feedback! I'll look into implementing some of these ideas in the next feature release! I have been using the client side and admin themes on one of my WHMCS installs for quite some time now and am verry happy with the quality of the template, I have noticed the changes that John has been implementing to better the templates with each update and am verry happy with the quick turn around on the latest version that is compatible with each WHMC update. I have also found the template quick easy to customise to suit my needs and just recently my new Clients needs who i have recommended this template to for their own WHMCS. Thank you for the review Nicholas and I'm happy your clients are enjoying it as well! Thank you so much for your feedback, Tobias. I really appreciate it! I love this theme, clean and responsive. I like the fact that you can modify this as well so that it blends with whatever style you have. Thank you so much for the honest feedback. I really appreciate your business! Thanks for a clean, responsive theme with many features. Nice to see some one is doing their job to a+, and will be using this for a long time now. You're very welcome Peter and thank you for the support and business! This theme is amazing! Very clean and modern. Support is fast and excellent! I can safely say we will be using this theme for some time to come! Awesome Blake! I'm glad you're enjoying the theme and thank you for your honest feedback. 8 months after this review, this guy proves he's as classless and fraudulent as the day that the service was bought. Not only has he NOT fixed issues with the theme that were brought up to him, but NOW, after months of not talking to him, he's flat out denying me access to purchased products. Products that I've PAID for. I go to login, and find that my email / pass no longer work. No worries, it's possible that my email / password have changed, it happens. I go to recover the password, and what do I see ? This guy is a scammer, big time. The theme was not set to expire (w/o updates paid) until FEBRUARY, yet , lo and behold, he's locked out my account, WITHOUT refunding it. Just to give some context to this review. There are some clients which you will never be able to please. They complain about issues which you have no control over, they belittle you and offer no apology. The customer is not always right in this case. I stand by my product and let the rest of the reviews here from clients who have worked with me for a long-time speak to this. "The theme might be great, but come on, this is a pretty poor attempt here"
"I do expect that you do your job, read through these tickets, and actually address concerns in a proper fashion." "I realize that you don't like tablet users (clearly), but come on, show a little respect for your clients and at least give them the CHOICE." "If you're going to refuse to address this, this is a no go. You'll need to refund the purchase price and I'll find somewhere else." Despite repeatedly targeting me with insults I helped this user and offered solutions to all their issues. One particular issue (which was a UI change he wanted me to make) would have created a worse user experience for everyone. Even after I provided detailed examples of how other admin themes function in this regard, he closed the ticket and left a 1 star review. You just cannot please everyone. The reviewer actually wrote a review later. I do not want this to turn into a "he say, she say" situation because I know what I've offered has been above and beyond, but you simply cannot help everyone. They either do not give you the opportunity to or simply want to find a reason to harass you. If anyone is interested in learning more about this situation I am happy to talk to them. This has been one of the most interesting situations I have been through. However, no one can break my dedication to providing awesome themes. Thank you for this experience, because it has taught me a lot. The Theme is something New, Fresh and changes WHMCS completly (in my mind). Its one of the best themes I've seen this far with a Dashboard Style. I would just change one thing, being able to remove the Copyright at the bottom. Hi Martin, thanks for the feedback! I'm definitely looking into removing the copyright in the very near future! I bought this theme besides the Admin theme Swiftmodders also made. The themes have a great design for a fair price. I had some questions about the theme and John helped me within minutes after creating a help ticket at his site. I bought both the admin and client theme and I am very happy with the result. I had a minor issue that had nothing to do with the theme, and John logged in and fixed it for me anyway. Check out the demo and see if its a good fit for your business. John is one of the friendliest developers you'll ever run into. Template prices keep climbing across the market. Complexity keeps growing also. This template is great looking. Very reasonably priced and dead simple to install. Great job John! Thanks for your kind words Roger! I greatly appreciate it! John, you have out did yourself again! Excellent Client Area Theme. Thank you!